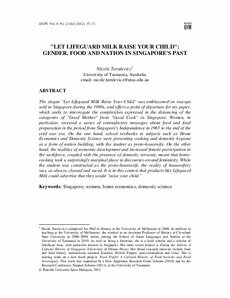 The slogan "Let Lifeguard Milk Raise Your Child" was emblazoned on teacups sold in Singapore during the 1980s, and offers a point of departure for my paper, which seeks to interrogate the complexities expressed in the distancing of the categories of "Good Mother" from "Good Cook" in Singapore. Women, in particular, received a series of contradictory messages about food and food preparation in the period from Singapore's Independence in 1965 to the end of the cold war era. On the one hand, school textbooks in subjects such as Home Economics and Domestic Science were presenting cooking and domestic hygiene as a form of nation building, with the student as proto-housewife. On the other hand, the realities of economic development and increased female participation in the workforce, coupled with the presence of domestic servants, meant that homecooking took a surprisingly marginal place in discourses around femininity. While the student was constructed as the proto-housewife, the reality of housewifery was, as always, classed and raced. It is in this context that products like Lifeguard Milk could advertise that they would "raise your child."